This article describes how to install and configure WordPress 3.x on Windows Server 2008 R2 or Windows 8 by using the Microsoft Web Platform Installer (Web PI) version 4.5, the latest version in time of writing of this article is WordPress is 3.5.1. The Web PI is a free tool that makes getting the latest components of the Microsoft Web Platform—including Internet Information Services (IIS), MySQL, the Microsoft .NET Framework, and Visual Web Developer—quick and easy. 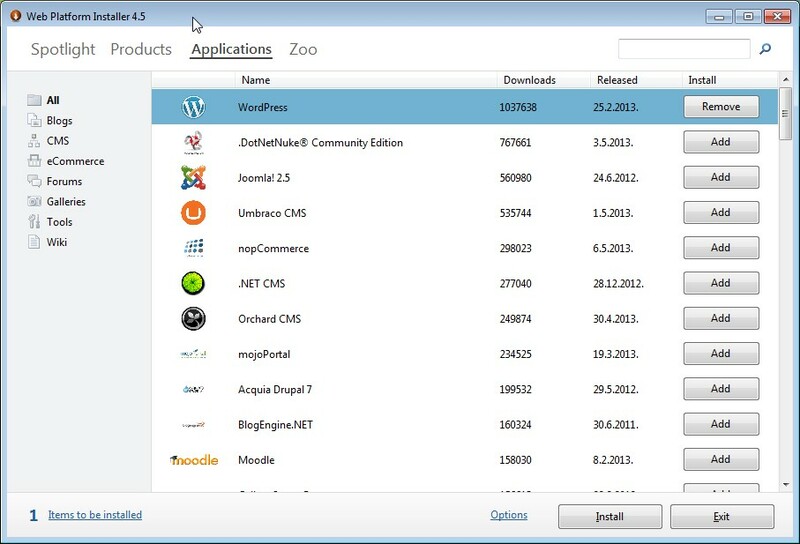 The Web PI also lets you install web applications such as WordPress with the built-in Windows Web App Gallery. The supported operating systems for the Web PI 4.5 are Windows 8, Windows 7, Windows Vista Service Pack 1 (SP1), Windows Vista, Windows XP Service Pack 2 (SP2) and later versions, Windows Server 2008 R2, Windows Server 2008, and Windows Server 2003 Service Pack 1 (SP1) and later versions. In this step, download and install the latest version of the Web PI which is in time of writing this article 4.5. In this step, you select the version of WordPress that you want to install. WordPress 4.5.1 is used in this guide. Next to WordPress, click Add. Note: If WordPress is not in the items list, click Applications in the left navigation pane. In this step, you review and configure what you have added. Additionally, you add the database, name the MySQL database, and name the WordPress 3.x site. When you are asked which type of database you would like to use, leave MySQL selected. Specify a password for the MySQL administrator user name (root), and then click Continue. Note: This will install MySQL Windows 5.1 to handle all the database transactions that are required by WordPress. Allow the Web PI installation to complete. In the Web Site box, leave Default Web Site selected. In the 'WordPress' application name box, type a name for the WordPress 3.x site, and then click Continue. For example, type my WordPress. Click Finish and Click Exit to close the Web PI 3.0.. In this step, you complete the installation. Switch to Internet Explorer. Go to your WordPress website. For example, go to http://localhost/wordpress/wp-admin/install.php. In the Site Title box, type the name of your site. In the Password, twice boxes, type a password for the admin account. Type admin, type the password, and then click Log In. WordPress is free, open-source content management system (CMS) software that lets individuals or communities of users easily publish, manage, and organize a wide variety of content on a website. Windows Cache Extension for PHP is a PHP accelerator that is used to increase the speed of PHP applications that are running on Windows and on Windows Server. After Windows Cache Extension for PHP is enabled and loaded by the PHP engine, PHP applications can take advantage of the functionality without any code modifications.